For more information on the District’s Local Control Accountability Plan (LCAP), click here. 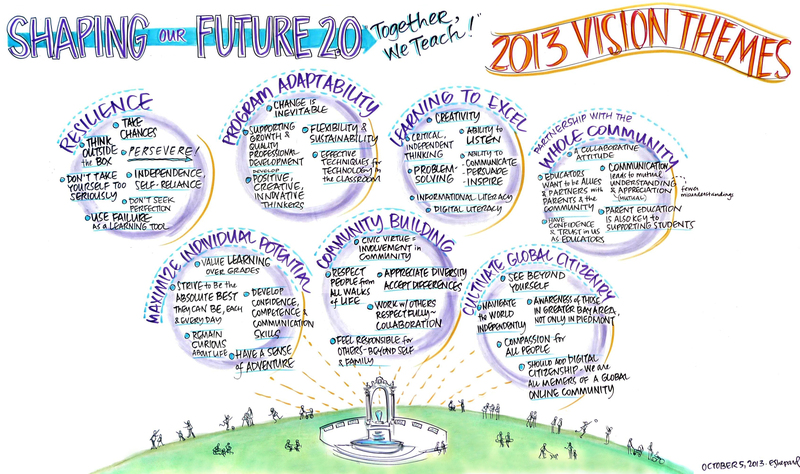 On October 5, 2013, the Piedmont Unified School District, with the support of the Piedmont Educational Foundation, collaborated with over 100 students, staff, and parents/community members during the “Shaping Our Future 2.0” strategic planning workshop. Building on the 2009 Shaping Our Future initiative, the District engaged with stakeholders in order to update the guiding principles and priorities for the next several years. Outcomes from SOF 2.0 will ultimately help to inform policy, particularly as the District moves to implement the new Common Core Standards and adapt to the changing needs and innovations of public education for the community’s children. 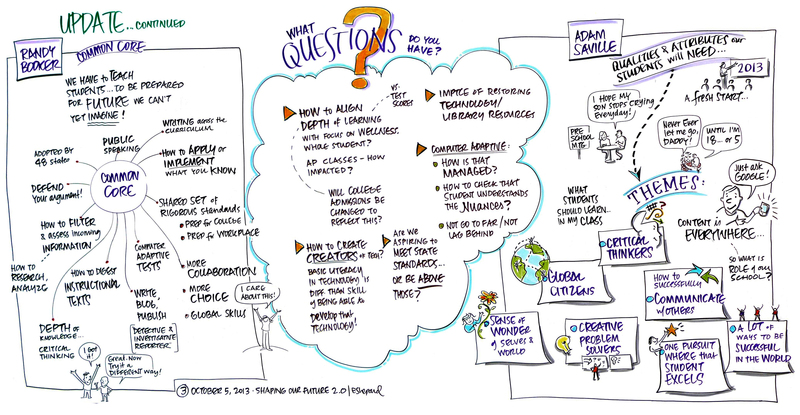 Shaping Our Future 2.0 was a unique opportunity for students, staff, and the parent community to reflect and collaborate together to update our guiding themes. In 2009, this teamwork between the District and community created seven themes: Partnership with the Whole Community, Cultivate Global Citizenry, Resilience, Program Adaptability, Community Building, Learning to Excel, and Maximize Individual Potential. These seven themes have guided the development and implementation of District policy concerning every facet of the K-12 educational program. Each year the Board of Education’s Goals and Action Plan have reflected progress in each of these themes. Survey Summary Results – What do you the individual contribute to the students’ success in PUSD? 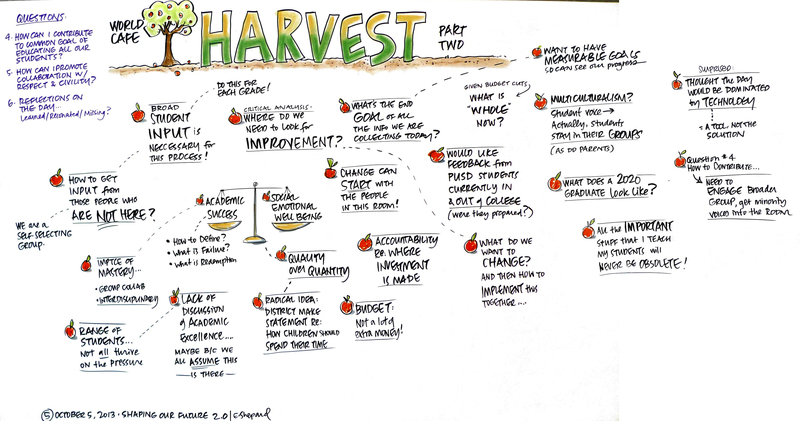 Survey Summary Results – What is most important for PUSD going forward? Last spring, we developed a mechanism for parents to let the school system know how we are doing in delivering education to their children. We want to thank Hillsborough City Elementary School District for allowing us to use major segments of a survey that they developed in collaboration with their community to solicit input from parents. We used SurveyMonkey as a tool to capture and summarize the response data. This information along with other statistics and information gives our school district a more global picture of how we are doing. Our hope in asking the questions was to get a baseline reading that we plan to monitor on an ongoing basis. The survey was posted for approximately 15 weeks last summer for parents to complete. Every family was asked to complete one survey per grade level (elementary, middle, and high school levels), which took approximately 15 minutes to complete. The overall participation rate for this initial survey was 49 percent, with participation rates at each school site ranging from 42% to 62%. We understand from those with experience in market research that 50% is high in similar engaging categories, where 2% response rates are seen in low engagement categories such as research on printers, and up to 80% response rates are observed with employee satisfaction work. Survey results will be used by school principals, staff, and site councils to help focus annual goal setting and communications efforts at each school. Over time, the longitudinal results also will help seed conversations at the district and board level that will help district administration and the board set direction and guide district-wide self evaluations of programs and services provided to students.